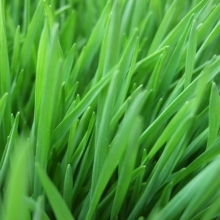 Summary: Wheatgrass is a great natural remedy that can cure a variety of ailments. Get some today and treat yourself! Through my work with sufferers with degenerated bodies, many have been completely renewed through the use of living, organically-grown uncooked food. My work in aiding ailing folks through the years had convinced me positively that all bodily disease generates in the colon. Constipation is the greatest single menace, greatest health destroyer. The reason for this is that the colon is the collective dumping ground for the waste material from the digestive organs. Much of the modern food is not digested properly because of lack of enzymes in the food which have been killed by heat etc. Should this debris not be eliminated from the body within a limited time, it rots, gases form, and it becomes a breeding ground for harmful bacteria. These germs set up housekeeping in the weakest spots of the body and in these spots disease starts to flourish under various names. The toxins and poisons formed in the colon gradually work their way into the bloodstream. This contamination frequently overtaxes the liver and weakens the kidneys. A wise doctor once said, "The only sickness which exists in the body is toxicity. Healthy cells, nourished properly, are immune to such attacks." The waste from the colon should be eliminated as often as food is taken into the body. Do you have a tobacco habit? Are you utilizing painkillers or digestive aids? Are you free from nervous instability? Are you always hungry and tend to overeat often? Do you crave nourishment you know is not suitable for you? Are you happy, and do you live a satisfying life? Do you have sufficient faith to carry you through emergencies? Are you free from body odors? Do you have dental defects? Has your hair turned grey and are there bald spots? Do you have facial wrinkles and are you worried about aging? Do you have adequate bowel movements - as many as you have meals each day? Our simple remedy for helping people is the God-given chlorophyll of the wheatgrass. Nature uses it as a body cleanser, rebuilder, and neutralizer of toxins. The effectiveness of chlorophyll, derived from fresh wheatgrass juice and sprouts of various grains and seeds is under study at many important research institutions. Dr. Richard Willstater observed that the chlorophyll molecule bears close resemblance to hemoglobin, the red pigment in human blood. Dr. Birscher a research scientist, said "Chlorophyll increases the function of the heart, effects the vascular system, the intestines, the uterus, and the lungs. It raises the basic nitrogen exchange and is therefore a tonic which, considering its stimulating properties, cannot be compared with any other." I planted seeds from grasses all over the world, and only seven grasses qualified for quality: rye, timothy, broome, wheat, canary, alfalfa and buckwheat. I arranged my seven small pots of grass, and into the room I placed a small kitten. The kitten sniffed each grass before choosing the wheatgrass to chew. But I wanted more proof and borrowed a little cocker spaniel. Like the kitten it too chose the wheatgrass. There could be no doubt, wheatgrass was the grass I sought. I tested the wheatgrass juice on my own body and on my friends and animals. We felt new energy and alertness. At the end of a few weeks, chicks receiving the wheatgrass had grown twice as large as their co-borns. The wheatgrass fast consists of three or four wheatgrass juice drinks each day plus two chlorophyll implants. Upon awakening, drink two glasses of warm water with the juice of one lemon added. This may be sweetened with molasses or honey. Then the colon should be cleansed with an enema. Four ounces of the pure wheatgrass juice should be sipped three times a day at well spaced intervals. Each drink may be diluted with as much tepid water as desired. 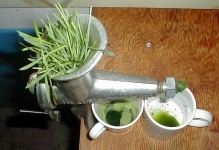 One quart of water should be drunk daily, placing a wisp of wheatgrass in each drink to purify it. We use baker's trays, 1" by 18" by 26", but any type of box or container will do. Use rough soil, not sand. Soak the wheat in water overnight, and use the soaking water to moisten the earth. Line the trays with peat moss and this will prevent mildew. Leave a gully around the earth for the extra water to run in. Do not compress the earth. Spread the seeds thickly and cover with wet newspaper and plastic sheet to keep in the moisture. When the sprouting wheat begins to push up the covering, remove it. Usually the seed takes from 6 to 14 days to grow sufficiently for harvesting. When ready cut near the roots. To extract the wheatgrass juice, use an ordinary meat grinder. Do not use your blender. The chlorophyll must be used immediately after extraction. As a sterilization property in the lab, Dr. Earp-Thomas found it more effective than boiling water. Wheatgrass protects against radiation. Grown in the home, it is an excellent air freshener. It neutralizes chemicals in food and water. A few blades placed in water neutralizes the fluorine. Apparently it renders the inorganic chemicals harmless. Fruits and vegetables contaminated by sprays can be cleansed in water with a wisp of wheatgrass in it. As a healing agent for burns and cuts, it lessens the pain and prevents infection.